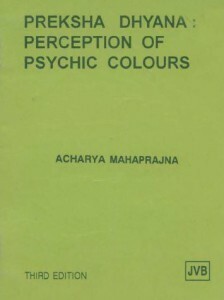 Perception of Psychic Colours is a book about Preksa Dhyana, a technique of meditation for attitudinal change, behavioural modification and integrated development of personality. It is based on the wisdom of ancient Jain philosophy and has been formulated in terms of modern scientific concepts. The different methods of Preksa Dhyana (i.e. perception) include svasa-preksa, (perception of breathing), sarira-preksa (perception of body), chaitanya-kendra-preksa (perception of psychic centres, etc. All these are methods of transformation by practicing perception. Preksa Dhyana is a technique of meditation for attitudinal change, behavioural modification and integrated development of personality.